I’ve grown up on extraterrestrial films. They want out planet, our resources, our breed-able women, or to kill us just for sport. Whatever the motivation I’ve seen it all, but rarely has a sci-fi film transported me out of this world the way Under the Skin does. An alien has taken the outside appearance of a very attractive female named Laura (Scarlett Johansson) in Scotland. Her mission is to lure very horny men to established alien safe-houses where the men are then put into a sustaining liquid meant to preserve them while their organs are being harvested. She is guarded by a fellow alien in the skin of a man dressed as a motorcyclist who is mainly around to monitor her and to tie up any loose ends. They serve the purpose protector and officer making sure their agents stay in line. Laura goes about her mission emotionless and dispassionately. She changes her personality at whim to seduce men. The aliens are clever in that they only target the ones who will not be missed. Laura begins to change after witnessing one of her marks try to save a man from drowning. Unable to understand why he would risk his life for a stranger, she kills. Slowly, we witness her transformation as she starts to truly embrace everything that comes with being human and embracing our humanity. This includes all the good and evil that comes with it. The story is very heavily driven by one character and a whole lot of striking imagery. Scarlett Johansson is at the head, giving us such a powerful performance as we haven’t seen from her since Lost in Translation. Through her subtle expressions we can tell exactly how this alien being is feeling, what she’s experiencing, and the great inner struggle that is swelling up inside of her. The cast is so minimal that their character names don’t even really matter. The only reason we know the female alien is called Laura is because we hear her say it once, maybe twice, as she’s luring men to their deaths. That is why it is necessary to pay attention to every expression, detail and nuance of her character because it is essential to the understanding of the story. Her evolution from indifferent femme fatale to compassionate humanoid is only augmented by the impressive visuals. The other crucial part you need to accurately interpret this easily confusing (for some) story are the visuals. The beautiful, mesmerizing imagery not only help to explain the process and the alien’s purpose, but it also helps keep the film visually stimulating and engaging. The film would be a dull mess without it since only about a third of the film (or less) is dialogue. The rest of the film is an elegant exchange of striking images and forms of nature and sensuality/sexuality all on an existential quest that is meant to make us question what exactly makes us human. The way director Jonathan Glazer frames and films each shot is almost reminiscent of 2001: A Space Odyssey, and not just because they are both sci-fi endeavors. 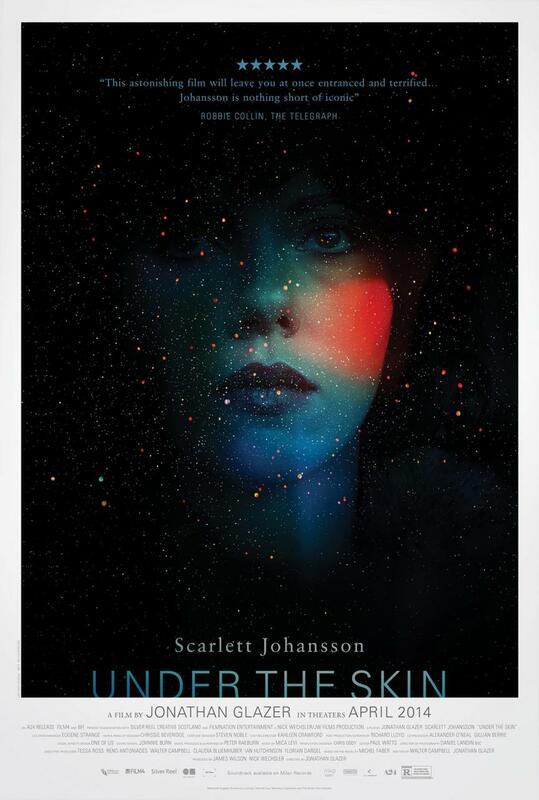 Under the Skin is easily one of the most visually haunting films of 2014. Scarlett Johansson is stellar as alien finding her humanity in an existential crisis. If you like her as a Black Widow, then you’ll love her as a real man-eater who develops a conscious. Her entire performance would be diminished without the enthralling imagery to underscore it. After the film’s over, you’ll leave the theater feeling how I did: with goosebumps under my skin and wondering if having humanity is really a human trait. Like me, you wouldn’t have it any other way. Previous ArticleTV Review: The 100 1x103 "Earth Kills"